Democratic politicians and aides have joined the media in publicly denouncing two-time failed presidential candidate Hillary Clinton's comments insulting President Donald Trump’s voters. 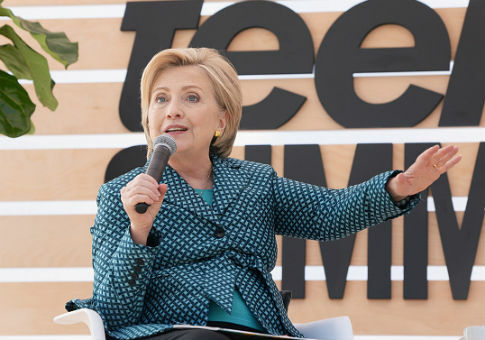 During an interview in India last weekend, Clinton said Trump’s voters "didn’t like black people getting rights" and don't contribute as much to the economy as her voters do, causing immediate criticism across the political spectrum. Sen. Claire McCaskill (D., Mo.) told the Washington Post that Clinton’s comments were "fighting words" to her as a Missourian. "Those are kind of fighting words for me because I’m partial to Missouri voters," McCaskill said. "I think they were expressing their frustration with the status quo. I may not have agreed with their choice, but I certainly respect them. And I don’t think that’s the way you should talk about any voter, especially ones in my state." Ohio Sen. Sherrod Brown (D.) said he doesn’t "really care" about Clinton saying things unhelpful to the party. "I don’t really care what she said," Brown told a HuffPost reporter. "I just think that that’s not helpful." Former Clinton aides pointed out that her comments are forcing Democrats all over the country to scramble to distance themselves from her. "She put herself in a position where [Democrats] from states that Trump won will have to distance themselves from her even more," one former senior Clinton aide told The Hill. "That’s a lot of states." "She’s annoying me. She’s annoying everyone, as far as I can tell," a 2016 Clinton surrogate said. "Who lets her say these things?" A former Obama White House aide said it will help Democrats if Clinton could restrain herself. "If these statements are a form of catharsis, it would be in the Democratic Party’s best interest for her to get these out of her system soon," the aide said. "We need leaders like her to look forward to 2020 and how to unify the party, not continue to re-litigate the past." A former campaign manager for Clinton, Patti Solis Doyle, also criticized her old boss's words. "Look, this was bad. I can’t sugarcoat it," she said. Some consider Clinton an asset, however, such a former Clinton campaign spokesman Jesse Ferguson, who is helping the Democratic midterm effort in 2018. "Hillary Clinton speaking will always trigger the right wing that hates her, but she’s also a constant reminder that the majority of the country didn’t actually vote for the chaotic disaster we’re seeing on our TV every night," Ferguson said. Meanwhile, some Republicans have credited Clinton with giving them fodder for their campaigns. "As she continues to give these paid speeches throughout the world, I mean, the campaign ads write themselves," National Republican Senatorial Committee spokeswoman Katie Martin said. This entry was posted in Politics and tagged Claire McCaskill, Democratic Party, Hillary Clinton, Republican Party, Sherrod Brown. Bookmark the permalink.